Swirling metal vines and crystal buds come together for an incredible display of light and sparkle straight out of a fairytale. 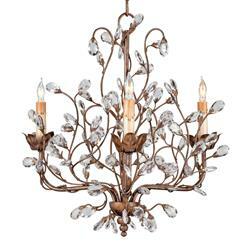 With a wrought iron center column and floral accents finished in gleaming antique copper, this three bulb chandelier makes a big statement. Use it to instantly bring a touch of fantasy to a foyer, walk in closet or another smaller space.